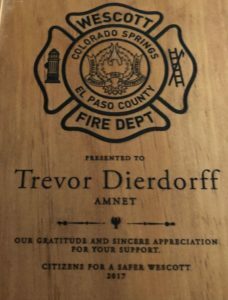 On November 18th, 2017 Trevor Dierdorff was recognized by the Wescott Fire Department for exceptional civilian services. The Donald Wescott Fire Protection District is located in Colorado Springs, El Paso County. The award recognized Dierdorff’s efforts in the Mill Levy Initiative in 2017. The Mill Levy Initiative is an important initiative recently introduced to the Wescott area, in an attempt to maintain current staff at the Wescott Fire Protection District. Trevor Dierdorff is commended for dedicating time, effort, and resources to the Mill Levy Initiative. Through his actions, Dierdorff has helped to guarantee the future of Wescott and the fire department. Fire Chief Vincent P. Burns presented the award. The Mill Levy Initiative is Wescott’s response to changing boarders and lowered funding for the Wescott Fire Protection District. The Mill Levy is an increased property tax on Wescott residents that will ensure the funding of firefighters and residents safety. The income generated by the Mill Levy will properly fund the fire district today and into the future. The total Mill Levy will be brought to 21.9 mills, as any amount less would result in the loss of staffing. Dierdorff was also presented an award from the Citizens for a Safer Wescott for his heroic actions. This award thanked Dierdorff for his support and gave him the gratitude and appreciation he deserves for his efforts. Because of his commendable efforts and support of the Mill Levy Initiative, this organization thought it best to award Trevor Dierdorff and publicly recognize his actions. Citizens for a Safer Wescott is made up of district residents and firefighters. These individuals are focused on providing the community with information regarding the Mill Levy Initiative. 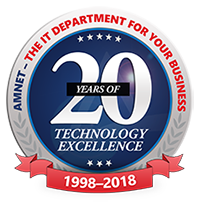 Amnet is a thriving computer consulting company that leverages the power of the cloud and focuses on strategic IT consulting to serve a growing number of small to mid-sized business clients. For responsive, friendly, and competent IT Services call Amnet at (719) 442-6683 or (303) 825-3228.